The Klondike Snowmobile Association is proud to serve as the official agent for the Trans Canada Trail in the Yukon. Born out of the Canada 125 initiative in 1992, the Trans Canada Trail (also known simply as “The Great Trail”) is made up of hundreds of individual trails, linked together to form over 20,000 kilometres of continuous multi-use trail connecting Canada from coast to coast to coast. The trail now passes through every province and territory, and is recognized as the longest recreational trail in the world. In early 2016 the K.S.A. and Trans Canada Trail were proud to announce that the Yukon Territory has become the third province/territory to achieve full Trans Canada Trail connection. There is over 1,600 km of Trans Canada Trail in the Yukon, stretching from the B.C./Yukon border south of Watson Lake to the N.W.T./Yukon border on the Dempster Highway. The Yukon portion of The Great Trail has something for everyone, including major highways, non-motorized urban commuter trails, remote wilderness snowmobile trails, and virtually everything in between. The Klondike Snowmobile Association strongly believes in the Multi Use Trail concept. Snowmobilers, skiers, mushers, hikers, bikers, ATVers, and everyone in between are considered a welcome sight on our trails. With the Yukon’s beautiful scenery and abundance of historical trails, The Great Trail concept has been tremendously successful among Yukoners and the potential for expanded tourism is real. We encourage all Yukoners and visitors to the Yukon to promote, share and enjoy The Great Trail in the Yukon. The Whitehorse Copper Haul Road is the “main line” of The Great Trail in Whitehorse, running north/south just west of urban Whitehorse. It is routed through a copper belt last mined in the early 1980s, and the current road was originally constructed in the early 1900s as a spur line of the White Pass and Yukon Route railway to service these mines. For more information please check out our Copper Haul Trail page. The road now serves as a multi-use trail connecting many of the major multi-use recreation trail areas around Whitehorse, from Fish Lake road in the north down to the Peter Greenlaw Memorial Bridge over Wolf Creek in the south. Main access to the trail is via the Fish Lake road, Mt. Sima road, and several “Urban Connector” trails that lead to the various residential areas of Whitehorse. A recent survey suggested that nearly 90% of Whitehorse residents use this network of multi-use trails in some way or another. This “main line” of The Great Trail is very much multi use. In addition to snowmobilers, expect to see cross country skiiers, dog teams, horses, bikers, hikers, and ATVs on this busy trail. (Note: absolutely no wheeled vehicles are allowed on this trail between November 1st and March 31st of each year). In 1999 the K.S.A. & The Territorial Government signed an agreement making the Dempster Highway part of the The Great Trail. The Dempster Highway is the only road in Canada to cross the Actic Circle. This narrow band of gravel starts at the North Klondike Highway just a few kilometers south of Dawson City and connects to the Arctic Ocean over 500 km away. The route is based on an old First Nation trading route dating back to the last ice age. In fact, this was an ice free corridor during that period and many suspect the route of the “First Ones” to North America. In the fall of 1999 a specially designed inter-territorial gateway was erected at the N.W.T. – Yukon border. The only one of its kind. This is a land of extremes. Black spruce forests, two mountain ranges, wind swept tundra. Two major river crossings, ferry in the summer and ice road in the winter. 25°C one day and snow the next day is normal. Bears, moose, sheep, caribou, and wolves all far outnumber humans here. Even many of the plants and flowers are unique to this region. Services along the road are few and far between and travelers should be well informed before under taking this trek. Although a road, do not count on vehicle traffic for assistance. If you break down or get stuck it’s often several hours before the next truck or car comes along. Hikers & mountain bikes are common during the summer, winter travel is often limited by severe weather. This gravel highway is maintained year-round, however travelers should check road conditions before setting out as the road is often temporarily closed due to the condition of the river crossings and/or severe weather. The Dawson Overland Trail is a historic stage coach route connecting Whitehorse with Dawson City during the early 1900s. 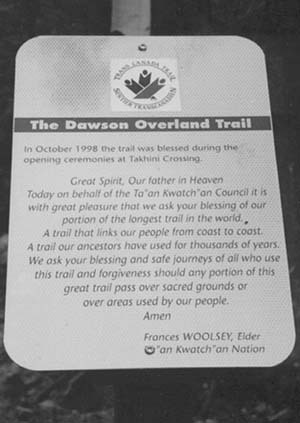 In 1998 was blessed by First Nations elder Francis Woolsey during the reopening at Takhini Crossing near Whitehorse. The modern day trail runs from Takhini Crossing in the Ibex Valley just north of Whitehorse to the Braeburn Lodge on the North Klondike Highway. The route follows the Little River and Klusha Creek valleys, taking the traveler through spectacular scenery beside the Miner’s mountain range. Also, around the half way point (approx. 50 km up the trail), the K.S.A. has built a small warm up shack. All our members are welcome to use it, but please respect it. The shack was built by volunteers and is not regularly maintained, so it is up to each user to leave it clean and ready for the next group. For more information on the Dawson Overland Trail, please check out our Dawson Overland Trail page. Travelers are advised to check with the K.S.A. for updated trail conditions before heading out. This is a class 5 wilderness trail and is still very much under construction. Users should be familiar with remote situations, and pack out what you pack in! Anyone who is interested in snowmobiling this trail with a group is encouraged to check out our Events page, as the K.S.A. often hosts a group ride from Whitehorse to Braeburn sometime in February or March. The area is also part of active trap lines. Please respect the trappers and do not touch traps or leave the trail area. Designated as a multi-use part of the The Great Trail, expect to see snowmobilers, skiers, hikers, bikers, horses, dog teams, ATVs and other groups using this trail. Although the Yukon portion of the The Great Trail is now fully connected, work on the trail is expected to continue for many years to come. In the Whitehorse area, as well as several other areas of the Yukon, general trail maintenance work continues on most multi-use sections of the The Great Trail. In addition to regular maintenance, many sections of the trail have significant upgrades and improvements planned for the next few years. Nearly all of this work is done by volunteers and donations, and new faces are always welcome! Anyone interested in getting involved is encouraged to contact the K.S.A. by phone, by email, or by coming out to one of our events or meetings. 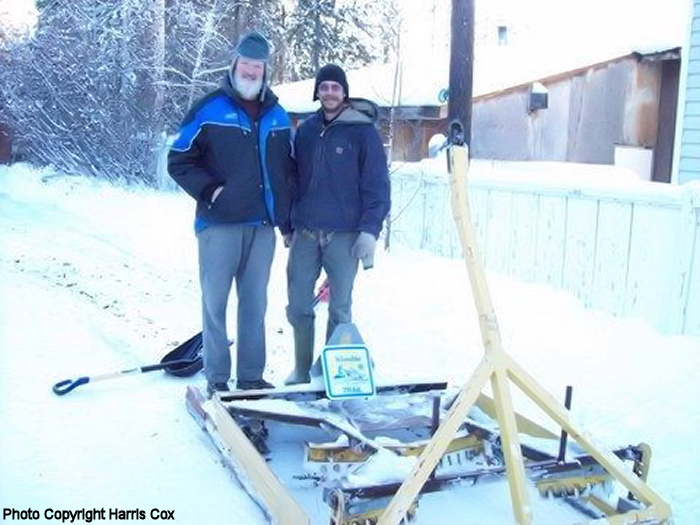 In May of 1999, the Liard First Nation and the Klondike Snowmobile Association entered into a partnership to complete a feasibility study on trails in the Southern Yukon. The Liard First Nation has been identifying traditional trading routes between Swift River and Lower Post, with the intention of making them part of The Great Trail. 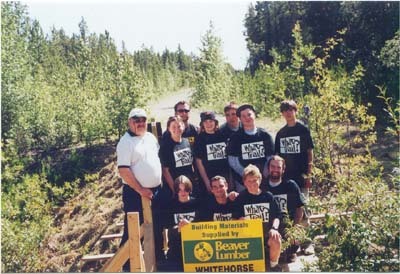 Also in 1999 the community of Watson Lake registered 18 km of “main line” Trans Canada Trail, and has since been working to improve and expand the The Great Trail in the area. Farther North, the Village of Mayo and the Na Cho Nyak Dun are working together to assess the old Conservative Trail. The trail was traditionally a First Nations trading route, and in the early 1900s it was adapted for use as a stage coach route. Now the village and First Nation are working together to create a trail that combines the histories of the town and its people. In 2013, work got under way in Dawson City, with help from the K.S.A., to upgrade a section of trail from the City south to the turn off for the Dempster Highway. 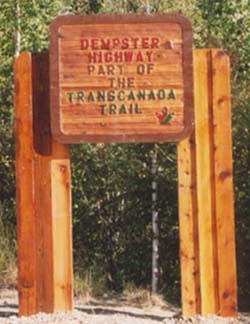 This section has since been designated as Trans Canada Trail, and officially links Dawson City into the national Trans Canada Trail network. Have an idea for improvements to The Great Trail in and around your community? Let us know! As the official Trans Canada Trail agent for the Yukon Territory, the K.S.A. would love to hear your thoughts, comments and ideas on the trail. Please contact us by email at klonsnow@yknet.ca, phone 867 667 7680, Facebook or Twitter.